Sent to Wellington City Council 32 sec later. 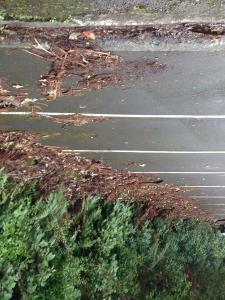 Carparks are littered with plant debris from adjoining bus land. Drains getting blocked and plant matter rotting creating foul compost smells. Water can't drain away from path areas making them extremely slippery and dangerous ( always wet & waterlogged ). Have seen council garden staff carefully leaf blowing a handful of leaves from garden bed in centre of carpark area but carparks are never attended to. As winter approaches each year these get more and more slippery and dangerous for anyone getting into / out of vehicles parked along bush side parks. this needs to be addressed regularly - the mess is impossible to miss ! !